Ah, the Monday blues – I can’t help but groan a little. It’d be nice if we were on a beach sipping piña coladas, but here I am daydreaming at the desk, stumped about what to wear, day after day. 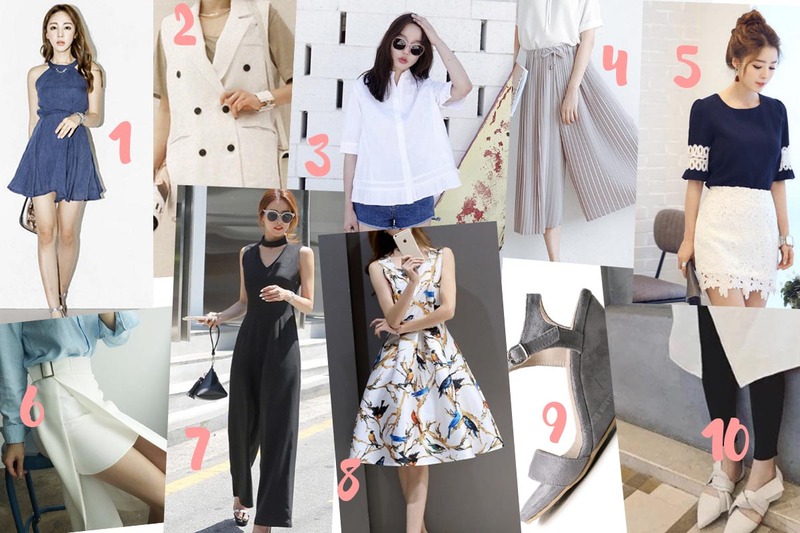 It pays to plan some easy and boss-approved looks that actually work in this hot weather! Here we’ve listed some combos – essentially some of the laziest looks that take only 3 pieces (or less – I’m all for one-pieces in the morning). Chances are we’ll wear these on repeat all season. This one-piece look is favored especially on time-pressed mornings. The halter neck shows skin in an unexpected way by highlighting the collarbone and shoulders, and the conservative neckline allows you to get adventurous with footwear, all the while maintaining a sophisticated look. Without the weight of a heavy blazer or cardigan, light and airy pieces like this vest provide an easy way to dress formally, while saving you from buying office pieces in bulk. The vest looks particularly good when worn over sleeveless sheaths. Smart office-appropriate tops can be pretty and polished besides being functional. With clean lines and subtle ruffles at the hem, this crisp, fuss-free blouse offers a minimalist look that makes an impact. Style with a colorful pencil skirt. I love the idea of pairing neutral-colored culottes with a silk tank (or blouse). This simple combo not only makes getting ready in the morning a cinch, but also exudes that much sought-after effortless chic. There are days when I need to dress a bit more formally, or conservatively in other words. With this lace blouse, hopefully I can still infuse some summertime lightness into the otherwise stiff outfit choices. Add cropped pants and court heels for a polished touch. There’s no better time to try out daring pieces than summer! The white keeps it versatile while the side slit gives a tastefully sultry spin. I might opt for pops of color from the accessories on a happy Friday. As the temperatures rise, the very thought of starched button-ups and structured blazers already makes me sweat. How about turning to this city-sleek, lightweight jumpsuit to transition from the creative office to a night out? Vibrant prints are a summer staple and fairly easy to work into office attire. Not the bright and bold, but pieces like this painterly dress that bias towards the more conservative side. I’d keep accessories neutral for the office. These sleek, very wearable wedges help me seamlessly transition from the boardroom to after-hours. I love the strappy design that lends casual sophistication. I’d be among the first to promote sleek court pumps as a surefire way to elevate office outfits. But that doesn’t mean I won’t stand behind a respectable pair of flats. These pointed flats work well with midi skirts or tapered pants to complete a polished, understated look that feels professional.